This essay examines the influence of Aby Warburg and the Warburg Institute, as mediated by Edgar Wind, on R.B. 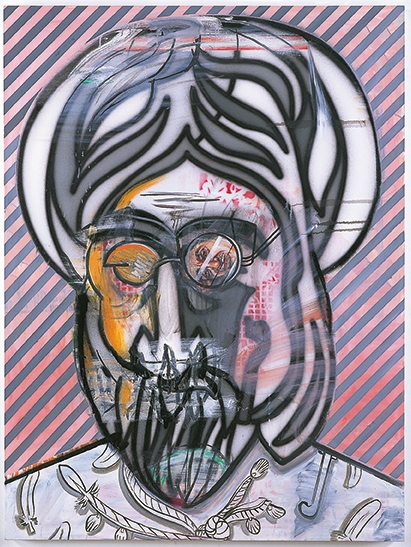 Kitaj from the late 1950s until his death in 2007. It is based on research in the National Portrait Gallery, the Warburg Institute Archive, the Wind archives in Oxford, Kitaj’s unpublished autobiography and correspondence between the author and the artist dating back to 1972. It explores Kitaj’s creative response to Warburg’s brand of cultural history which encouraged his early eschewal of the prevailing focus upon formal values in favour of ‘symbolic images’ and suggestive content. This tendency was enhanced by his increasing celebration of his Jewishness and aspirations towards the creation of ‘a Jewish art like the Egyptian figurative style’. Kitaj’s portrait of Ernst Gombrich (1986) was commissioned by the National Portrait Gallery at a time when he was becoming obsessed with his Jewish project while Gombrich was confirming his rejection of the category Jewish, in other than a religious context, altogether. Discussion of Jewishness and the arts in the twentieth century is supplemented by the identification of David Allan’s Origin of Painting (done in Italy in 1775) as the inspiration for Kitaj’s Los Angeles series of pictures in which his late, lamented wife is depicted as the Hebrew deity, Shekinah. Christo and Jeanne-Claude’s Wrapped Coast – One Million Square Feet, Little Bay, Sydney, Australia (1968-69) remains one of Kaldor Public Art Projects’ (KPAP) most significant projects, both artistically and in its impact on the local and international art scene. A private not-for-profit foundation, Kaldor Public Art Projects has presented site-specific temporary art projects by leading international contemporary artists in Australia for over forty years. Some of these projects, such as Christo and Jeanne-Claude’s, were important milestones in the development of contemporary art in Australia. Not-for-profit foundations now play an increasingly important and visible role in the contemporary art world. This essay considers the circumstances that surrounded the inception of one of the earliest of these foundations, Kaldor Public Art Projects. It considers the factors that led to its creation. These include John Kaldor’s upbringing and experience as an émigré in Australia; his mentors, Sir Nicholas Sekers and Claudio Alcorso; and the influences on and of his collecting interests. The essay argues that gallerists such as Ileana Sonnabend played a pivotal role in the development of Kaldor’s collection and artistic interests. Kaldor’s collecting interests also played a key role in the development of the Art Projects. The role of the collector and patron are inextricably linked. Art history has long struggled to find a method to account for the diverse expressions of queer desire across the heterogeneous landscape of history. While there has been a surge of research on the lives, artworks, and audiences of artists that trouble the heterosexual norm, the wider impact of this scholarship is often limited to singular biographies. Following the call for greater self-reflexivity and acknowledgement of difference in queer theory and phenomenological approaches to art history, the additive goals of gay and lesbian scholarship with its political investment in strategies of representation can be brought into scrutiny. To this end, a critical historiographical review of gay and lesbian art history is undertaken and a queer phenomenological method is presented as a new means forward. Applied to the work of John Singer Sargent, it is argued that a focus on the spatial orientation of bodies in his album of male nudes provides a more nuanced and ethical account of the queer than a focus on identity and identifications. This paper examines the historical narrative of Howard Arkley and Juan Davila’s collaborative art practice from 1984 to 1999. It is structured chronologically, to highlight a transformation in the duo’s combined processes — the transition from decidedly tense forms of delineated authorship towards a merged, copycat aesthetic. I draw heavily on Charles Green’s theory of the ‘third hand’ to define an alternate model of collaborative authorship, one which extends Green’s considerations. This paper proposes that Arkley and Davila did not operate under the guise of the third hand, but rather through a form of composite authorship, where the authorial traces of the artists are blurred but still infer their own collaborative construction. The paper concludes with the discovery of a drawing, dated and signed by Davila, which I argue is a reference to his collaborative friendship with Arkley and, furthermore, is an indication of their journey towards a composite form. Albert Namatjira was a pioneering Aboriginal artist who achieved unprecedented fame for his watercolour depictions of central Australian landscapes. In central Australia, there are artworks, monuments, landscapes and cultural sites that are marked as sites for remembering Namatjira. Drawing on Chris Healy’s Forgetting Aborigines, this essay examines the visual, spatial and material qualities of these memorials to consider what is remembered and forgotten about Namatjira. 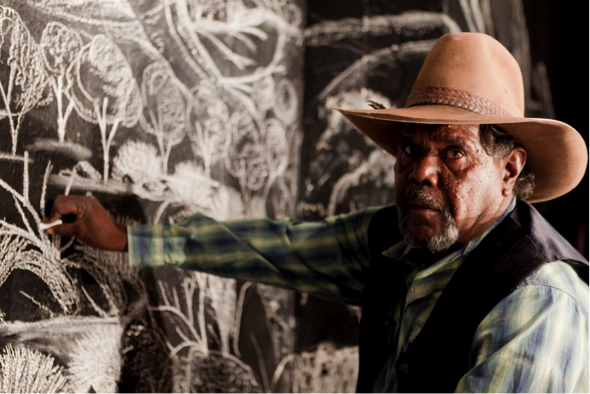 It suggests that recent cultural projects offer new ways of understanding and remembering Namatjira’s life and artistic legacy. emaj 7.1 2013. Published November 2013.